Tonight for dinner, we tried out some new recipes. Not only did we try new recipes, I tried this really cool website/app called Cooking Planit. 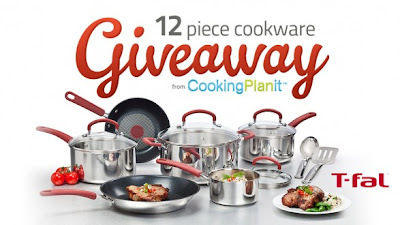 You may recall that a few months ago that I shared about Cooking Planit and you may recall that soon I will be hosting a T-Fal Cookware giveaway courtesy of Cooking Planit (the full list of participating blogs is located below, so you can check it out and enter to win on several blogs). Tonight though, I want to share with you about my experience with Cooking Planit. Cooking Planit has a website featuring many recipes and meals (the photography is great and makes me want to try a lot of the recipes). Cooking Planit is also available as a free app for your iPad or iPhone, so you can plan on the run - who hasn't been at the store trying to make an adjustment to the meal plan because there is a great deal on something. Think of Cooking Planit as your very own Personal Kitchen Assistant! Cooking Planit is an app perfect for a home cook at any skill level. 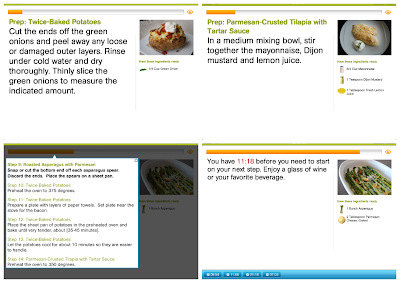 Cooking Planit walks you through the whole cooking process and keeps you on track so dinner get’s on the table on time! • Simplified Meal Planning - choose 'pre-set' meals or choose a few recipes that you want to try. • Build your menu and it will put together your shopping list. 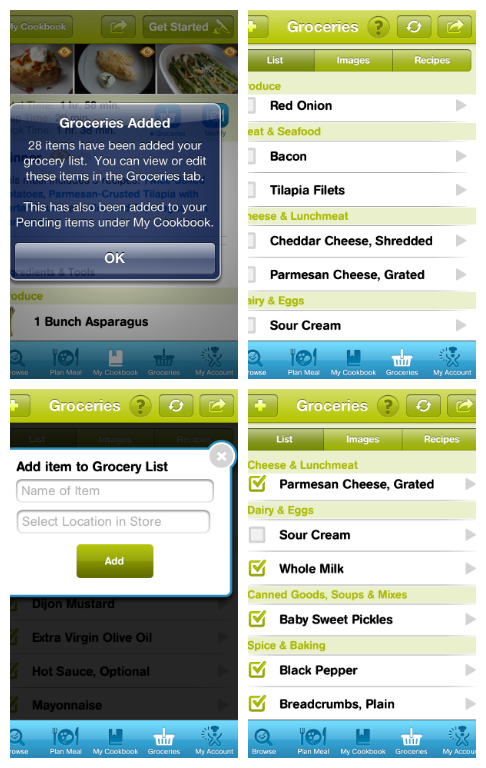 I started by setting up an account on Cooking Planit's website and then downloaded the app for the iPhone and the iPad. As I sat on my sofa watching TV one evening, I was browsing through the pre-set meals on the iPad. I bookmarked a couple of the meals as I scanned and then switched over to scanning and marking some of the recipes. I decided that to really check it out Cooking Planit and all it has to offer, I wanted to go with my own custom meal. So, yesterday, as I was planning my menu for the week, I sat down at my computer and did some additional searches, bookmarking more recipes. Then, I looked over the recipes that I had bookmarked to decide what would go best together and what was different than what we normally ate. I decided on Parmesan-Crusted Tilapia, Roasted Asparagus with Parmesan and Twice-Baked Potatoes. After building the meal and saving it, I decided to check out one of the features of Cooking Planit - I created my shopping list for my meal. I love that I was able to create and save my meal on my computer and then access my account from my phone to create a portable shopping list. After the grocery list is generated, you can add additional items to your list, indicating section of the store and get a complete grocery list. In addition, you can mark off the items that you have and update the list to only show those that you don't have. I did that and then also used the check boxes to mark the groceries as I moved through the store. Fast forward to tonight, it was time to prepare my dinner. I pulled the app up on my iPad and set it upon the easel in the kitchen. I then selected my meal on the app and it pulled up on the screen, ready to go. Once on my screen, it gave me a list of ingredients and tools that were needed, some information about prepping and cook time (mine was actually shorter...I cheated and microwaved the potatoes to prep them and used ready bacon!). I really like how it lists out the ingredient and tools. The ingredients are the total amount needed for all of the recipes and the tools let you know what type of equipment (measuring spoons, slotted spoon, baking sheet), appliances (oven and stove top), and supplies will be used (paper towels). When you select start, the app asks how many servings you would like to prepare - 2, 4 or 6. Of course, if you choose an alternate number of servings the ingredients you had seen on the first page are no longer what you need. Never fear though, because the next page will tell you the ingredients you need to gather for prepping and the quantities for each recipe. Then, it steps you through the preparation of your recipes, so that they all finish at the same time. On each step, it lets you know what ingredients you will need and what to do. You can either swipe you finger to advance pages or put it on audio controls, allowing you to use your voice to flip the pages. As you step through, you have the option to see the next few steps - I found that looking ahead gave me perspective of what was coming and allowed me to adjust where I needed (you know for the microwave or the ready bacon). When you get to a step where there is time until you start the next step, it suggests things such as clean up a little or (my favorite) enjoy a glass of wine or your favorite beverage. When there are cooking or sauteing steps, when you advance the page, it automatically starts a little timer that will pop up on the screen when it is complete and have you check that the item is done - if it is, you dismiss the timer, if not, you can select adjust and it will run a timer for a few additional minutes. My family very much so enjoyed the meal that I had prepared. It was full of flavor and yet, part of the beauty, to me, was the simplicity of the meal. There were few ingredients, but they paired well. I'm ready to build another meal and try out even more of the recipes that Cooking Planit has to offer. You can sign up for Cooking Planit on their website or you can down load their app at iTunes. There are both free and paid versions of the app, so you can try it risk free and then upgrade for even more features. Don't forget to check out the matrix of bloggers participating in the giveaway and be sure to come back tomorrow, when my giveaway goes live! No compensation was received for this post. As a participant in the Cooking Planit T-fal Giveaway, I was provided with a set of pans to use and share my experience with my readers. All opinions expressed are my own or that of my family. This looks good. Excited to try out Cooking Planit. Thank you for the introduction to Cooking Planit. I do most of my cooking/baking in the cooler weather & am always in search of recipes. I really am enjoying Cooking PlanIt. I have found so many things I want to make. The Roasted Asparagus with Parmesan and Twice-Baked Potatoes sounds divine. I have never had Tilapia. This looks good. thanks for the chance to win a great giveaway. I love how easy cookingplanit makes our cooking! Your dish is good! Hmmm..this looks really sumptuous. And very healthy as well.